Ah, Lethall Enforcers. 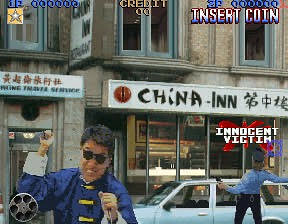 A classic arcade game. I have spent many a roll of quarters gunning down drug dealers (and the occasional innocent victim.) As far as light gun games go, this is one of the best. And you can play it two player! What more can you ask for? There was an old arcade called Family Fun Center where I used to live in Maryland. It closed down eventually, but I used to go there with my friend, and we always played this. We never won it though - eventually our arms got tired, or we ran out of quarters. Pity though. Like most arcade games, this classic was designed to eat quarters. Expect to plug in a lot, if you want to experience it for more than three minutes. 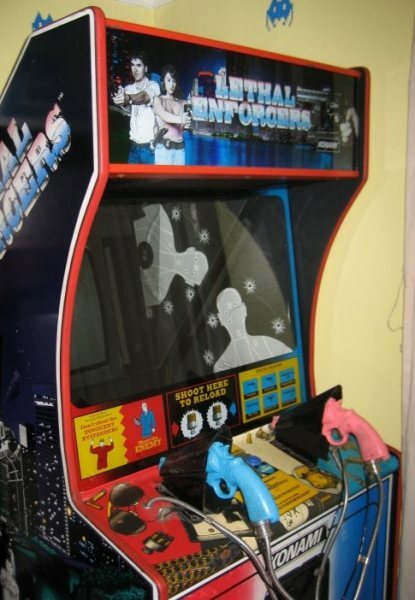 I think the movie theater near my parents' house used to have a cabinet for this. It’s pretty fun if you’re willing to pay for it. Plastic guns. I've definitely seen this cabinet, but I don't think I ever tried it. it's definitely one of the better lightgun games. Another Konami series is called Parodius, which is a silly spin off of the Gradius series. Anyway, one of the Parodius games has stages making reference to other Konami games. There is a DDR stage, a Goemon stage, a Twinbee level, and even a Tokimeki Memorial level (that's a Japan only dating game). Anyway, the 'speed' stage in that particular Parodius game is based on Lethal Enforcers! You even have to avoid recticules with guns in the foreground that shoot you from time to time! On an unrelated note, I ate so much food at this Italian restaurant I went to tonight. I had chicken cordon bleu, a plate of pasta, a salad, and a bowl of breadsticks. My belly looks like I swallowed a basketball! I'm stuffed! A shmup inspired by Lethal Enforcers??? that meal sounds great. We had reheated pizza. Ha ha. I don't think I've ever played this one. We had an arcade near us when I was a kid call Nickel-a-Play, where everything cost a nickel (or several for the newer games). You paid a small entrance fee and there were a bunch of old arcade games set to free to play also. Anyway, they had a light gun game called Carn Evil, which is just what you might imagine. In the opening cinematic, your player character is in a graveyard and sees a tomb stone with a coin slot. He pops a coin in and an evil carnival rises from the earth and you have to blast your way through it. Played that sooooooo many times. And here is a playthrough! So much Flashbacks with the words "Lethal Enforcers" and "Family Fun Center". I loved this game. I was screwed out of the Playstation version by a shady Hollywood Video employee. It blew my mind when you played this game because it was like a movie that you could interact with. This game needs to come to the Switch. EVERYTHING needs to come to the Switch!